It’s always a good thing when you can tick off a major goal. Especially when it’s a goal that you’ve been working towards for a number of years. So today I’m especially delighted to announce that my new picture book, Bella and the Blue Genie has been released. 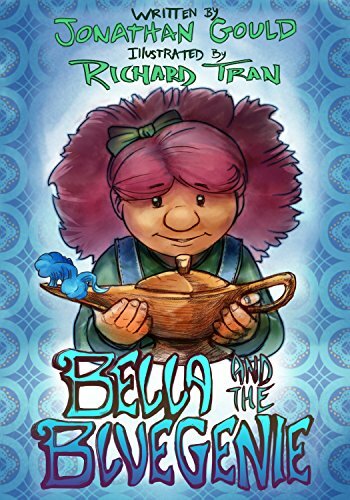 Bella and the Blue Genie tells the tale of a girl who discovers an old lamp amongst some odds-and-ends her parent have collected. Being a keen reader of stories, Bella knows full well what’s meant to happen when she rubs the lamp – sure enough, a genie appears. A bright blue genie, offering her the obligatory three wishes. However, as Bella starts to think about what wishes she desires, she notices the genie isn’t just looking blue. He’s looking awfully sad. Bella can’t bear to ask for any wishes from such a miserable genie. Instead, she tries to figure out ways to cheer the genie up. Bella and the Blue Genie is a story about friendship and helping others, and how there are many different ways wishes can come true. With fun and colourful illustrations from the very talented Richard Tran, it should delight readers (and listeners) especially around 3-6, as well as a few adults as well. You can grab a copy, in kindle version or paperback, from Amazon. Hard covers can be ordered directly from Evolved Publishing.